Pioneer Electronics (USA) Inc.’s Professional Sound and Visual Division today announced its DDJ-S1 DJ controller specifically designed for use with the popular Serato ITCH™ DJ software. The DDJ-S1 controller is designed for the next generation of DJ entertainers who leverage digital music files at home or on the go. DDJ-S1 features the same operability and functionality of a professional player and mixer set up in addition to exceptional audio quality. The DDJ-S1 allows for easy transfer of music from the user’s laptop with a USB connection for simplicity and quick ‘plug-and-play’ capability. For additional convenience, the controller also comes with a space saving computer dock that allows a laptop’s keyboard to slip directly under the controller, enabling its monitor to be closer to the DJ to provide fast visuals of song information while mixing. The device adopts Pioneer’s ‘P-LOCK Fader Cap’, designed to prevent the fader caps from slipping. Plug-and-Play USB Connectivity – All buttons and knobs have been pre-assigned, so users can quickly connect the controller to their laptops with the use of a USB cable, enabling them to start their performances without having to adjust any complicated settings. Additionally, the DDJ-S1 can be powered through the laptop’s USB port1. Multiple Input and Output Options – The controller is equipped with various inputs and outputs including a balanced XLR output and 2 Microphone inputs (XLR, 1/4 inch PHONE) for connection to professional PA equipment2. Designed Specifically for Serato ITCH DJ Software with Advanced Pioneer Functionality – The DDJ-S1 offers tight integration with Serato ITCH DJ software and is loaded with original functionality. Unique features include song progression status on a LED display; an alphabetic search function for quick song selection from large music collections; and a slip mode for looping, reversing, and scratching without changing the song tempo. The DDJ-S1 also includes needle search functionality to quickly skip through songs to a preferred playback point. Specially Designed User Interface – The controller layout and Serato ITCH software interface are the same, ensuring ease-of-use and precise control. The DDJ-S1 is modeled after the established design of the professional Pioneer DJ player and mixer and integrates centrally placed level meters and an effect control area, so DJs can add Serato ITCH DJ FX to the mix. 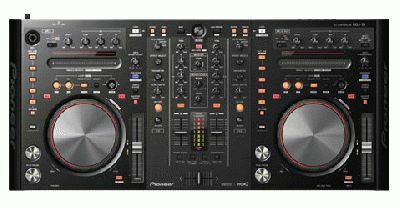 Highest-Quality Sound – The controller is optimized for Serato ITCH DJ software and incorporates technology from Pioneer’s professional line of DJ equipment to ensure the highest quality sound output. Proprietary lock mechanism called the P-LOCK Fader Cap designed to prevent fader caps from slipping3. Both microphone inputs are equipped with a talk-over function to lower the music volume when receiving voice input from the microphone. The Pioneer DDJ-S1 will be available in March 2011 with a suggested retail price of $1,599.